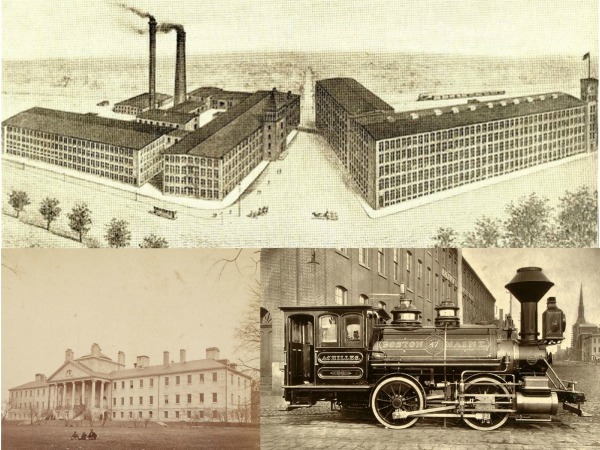 The industrial revolution completely transformed Massachusetts in the 19th century. It changed the economy, society, transportation, health and medicine and led to many inventions and firsts in Massachusetts history. The industrial revolution began in England and eventually spread to the rest of the world, but came late to the United States, finally arriving in the late 1700s and early 1800s. Massachusetts in the Industrial Revolution. Top Image: Berkshire Cotton Manufacturing Company circa 1898. Bottom Left: Massachusetts General Hospital circa 1860. Bottom Right: Boston & Maine Locomotive circa 1871. Before the industrial revolution, Massachusetts’ economy was based primarily on agriculture, fishing and maritime shipping. After the industrial revolution began in England in the late 18th century, American manufacturers were determined to improve American manufacturing. When the Embargo Act of 1807 cut off imports from Britain, this forced Americans to increase the amount of goods they manufactured. By 1810, the U.S. had built about 50 cotton-yarn mills. When the War of 1812 broke out, British ships blockaded the Massachusetts coast, completely cutting them off from the sea. This forced the state to not only find other ways to make money but also to supply their own needs, particularly cloth. 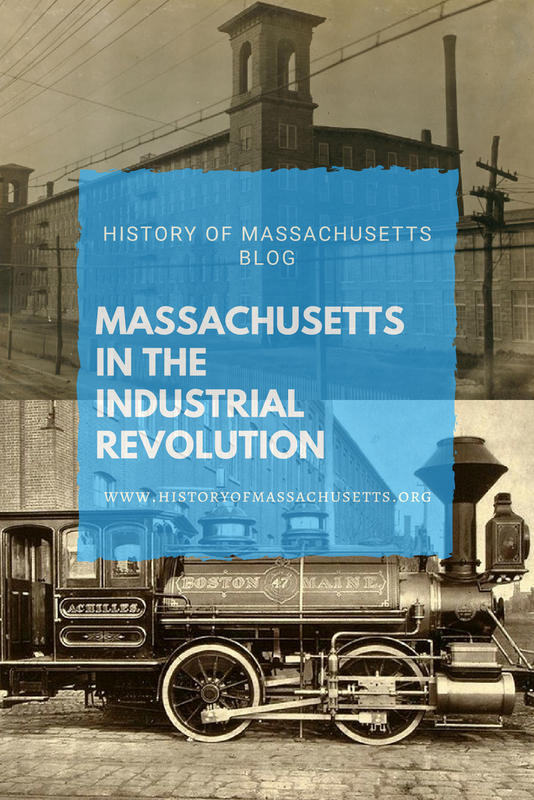 As a result, this sped up the process of industrialization in Massachusetts and textile manufacturing quickly went from being a cottage industry, where work was performed on a small scale at home, to a large scale factory system. 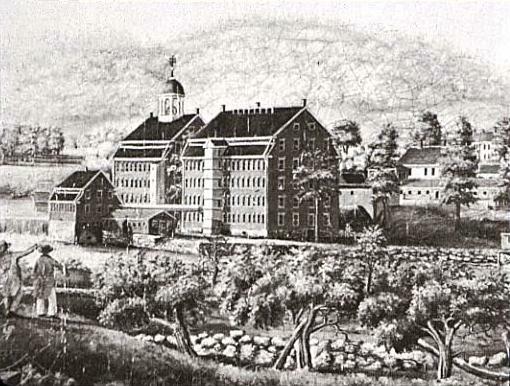 Textiles mills in Massachusetts played a pivotal role in the industrialization of the United States. Textile mills were the first manufacturers to use modern production methods during the Industrial Revolution and thus textiles became the dominant industry during this time period. The industrial revolution was brought to America by a British-born merchant, Samuel Slater, who built the first successful cotton spinning mill in America in Rhode Island, and also by an American merchant, Francis Cabot Lowell, who built the first integrated cotton spinning and weaving facility in America in Massachusetts. Lowell, who was born in Newburyport, Mass, in 1775, was a successful merchant who visited England in 1810, at the age of 36, and was so impressed by the British textile mills that it inspired him to start his own mills. In 1813, Lowell and several partners formed the Boston Manufacturing Company and introduced a power loom, based on the British model, that had been tweaked with many technological improvements. The company built a large brick mill next to the Charles River in Waltham, Massachusetts that incorporated various technologies to convert raw cotton into cloth. The mill integrated the chain of tasks under one roof, known as the Lowell System. This system was later adopted across the country and became the basis of the American manufacturing system. Lowell died of an illness in 1817 and left his company to his investors. Dividends were paid out and, in 1822, the investors started a new, and much larger, mill town, which they named Lowell in honor of their leader. The company was so successful that it continued to expand into other New England towns such as Chicopee, Mass, Lawrence, Mass and Manchester, NH. By the 1850s, the Boston Manufacturing Company, which was by then renamed the Boston Associates, was responsible for a fifth of America’s cotton production. The industrial revolution brought many advances in medicine and hospitals during this time period. As a result, new hospitals were established, such as the Massachusetts General Hospital, which was built in Boston in 1811. It was one of only three general hospitals in the United States at the time. Many medical firsts and discoveries were made in Massachusetts, such as the discovery of ether. These discoveries and advances changed people’s lives and dramatically improved health care in the 19th century. This led to the establishment of a number of state hospitals and mental health institutions in Massachusetts, including the first mental health institution, Mclean Hospital, which was built in Boston in 1811, as well as one of the most notorious state hospitals, the Danvers State Hospital, in 1875. The industrial revolution also sparked the transportation revolution during which the construction of roads, bridges, railroads and canals helped people move around more freely, increased trade, and forever altered the physical landscape of Massachusetts with massive public works projects, such as the Boston Landfill project. The first railroad in America, the Granite Railway (which later became the Old Colony and Newport Railway), was built in Massachusetts in 1826 and many more were built over the course of the 19th century. With this increased transportation came a demand for more accommodations for travelers. Many of the now historic hotels in Boston where built during this time period as a result. In the second phase of the industrial revolution, the Boston Subway, which was the first subway in America, was built using the same technology. Many notable inventions took place in Massachusetts, particularly during the Industrial Revolution. The machines, tools, equipment and greater scientific knowledge in the 19th century allowed for more experiments which led to new discoveries and inventions. Some such Massachusetts inventions were the telephone, vulcanized rubber and the game of basketball. Ackerknecht, Erwin H. A Short History of Medicine. John Hopkins University Press, 1955. The Encyclopedia of the Industrial Revolution in World History. Vol. 3, Rowman & Littlefield, 2015. Tucker, Spencer and James R. Arnold, Roberta Wiener, Paul G. Pierpaoli, John C. Fredriksen. The Encyclopedia of the War of 1812: A Political, Social, and Military History. Vol. 1, ABC-CLIO, 2012. Rosenberg, Chaim M. The Life and Times of Francis Cabot Lowell, 1775–1817. Lexington Books, 2011. Horn, Jeff. The Industrial Revolution: History, Documents, and Key Questions. ABC-CLIO, 2016. Memorial & Historical Volume, Together with the Proceedings of the Centennial of the Opening of the Hospital; The Hospital. Griffith-Stillings Press, 1921. Taylor, George R. The Transportation Revolution, 1815-60. Rinehart, 1951. As always, I have enjoyed reading here about the industrial revolution rooted in my ancestral state of Massachusetts. My English ancestors arrived in mid 1600’s, another family line arriving from England in 1819 as industrial changes were getting underway. History fascinates me, especially when you have knowledge of how and where your own people fit into the picture. Well done Rebecca!